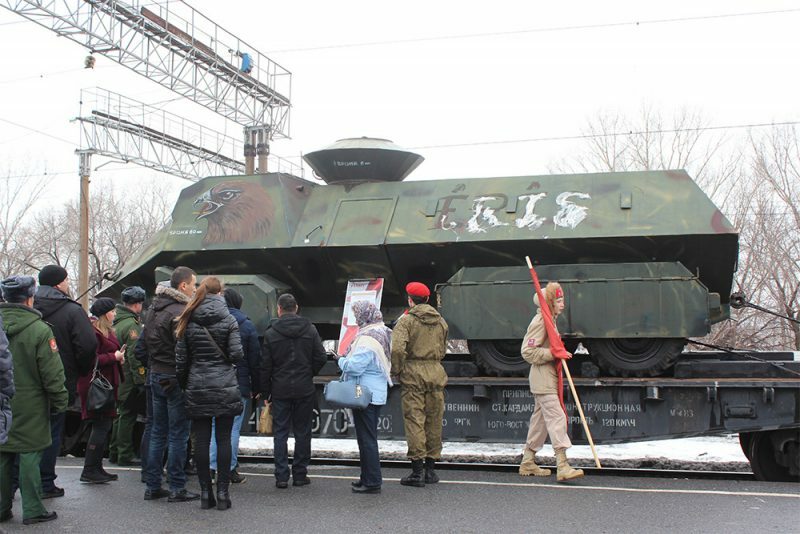 On February 25, an exhibition of Syria War trophies “Syrian Breakthrough”, organized by the Ministry of Defense, started its railway journey across Russia. Visitors can see vehicles and weapons captured in Syria by pro-government forces. The exhibition is certainly of interest to modern war historians. However, when we studied photographs from the exhibition, we found out that the information provided for most items on display does not allow to trace the actual history of the trophy, occasionally even sliding into blatant propaganda. We decided to give a closer look to the most prominent exhibits. 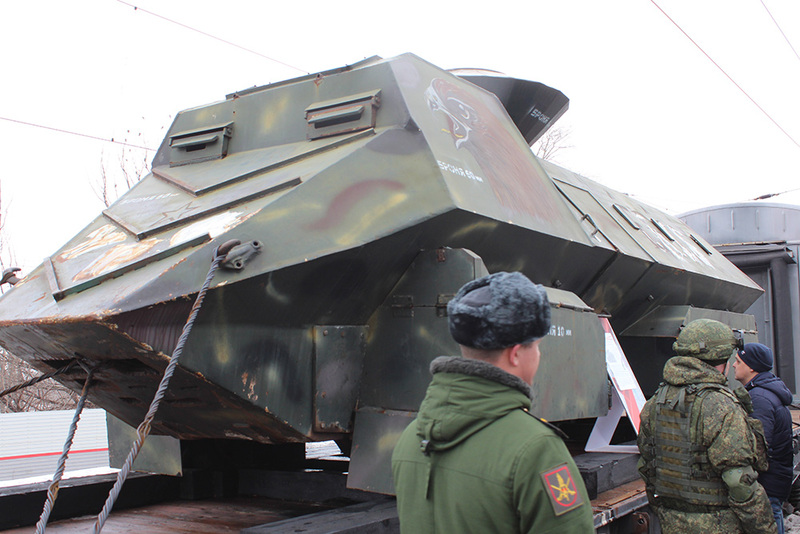 For some of them, we and other researchers found photos and videos of the same or similar vehicles in the war zone. 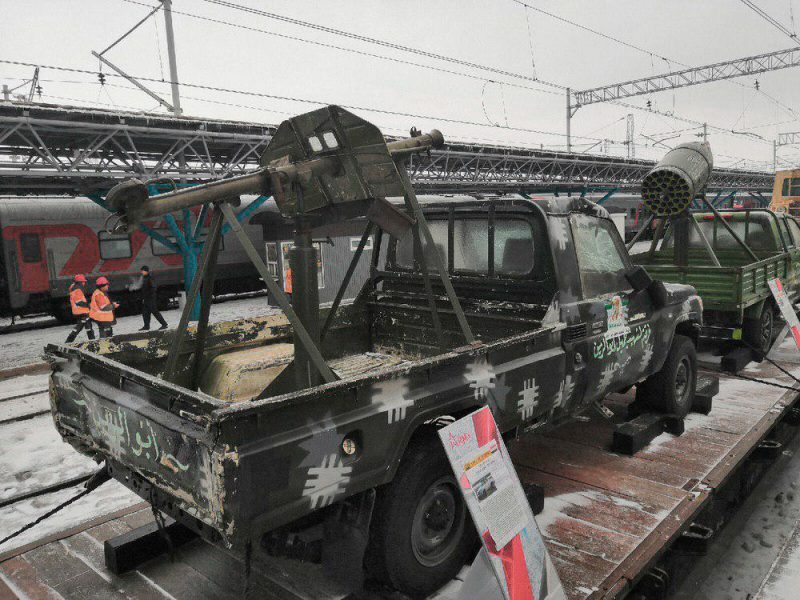 Various parties to the Syrian war get their hands on different mass-produced and improvised vehicles in a number of exciting ways. The vehicles are most often either captured in military storage facilities or on the battlefield, or received from foreign partners. Before ending up at the “Syrian Breakthrough” exhibition, some items on display changed hands several times. One example are American HMMWV (Humvee) armored cars, repurposed as suicide vehicle-based improvised explosive devices (SVBIEDs). 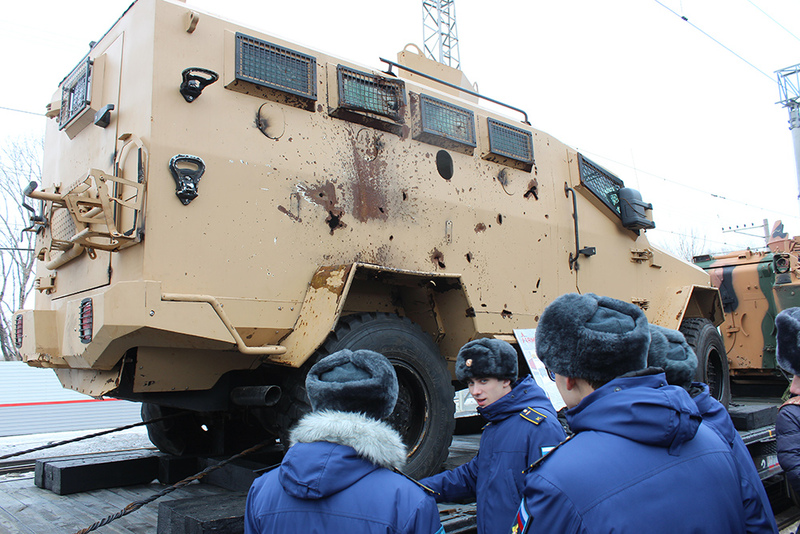 You can see that in these vehicles the driver’s field of view is sacrificed for armor — the suicide bomber does not need a wide field of view to complete his mission. 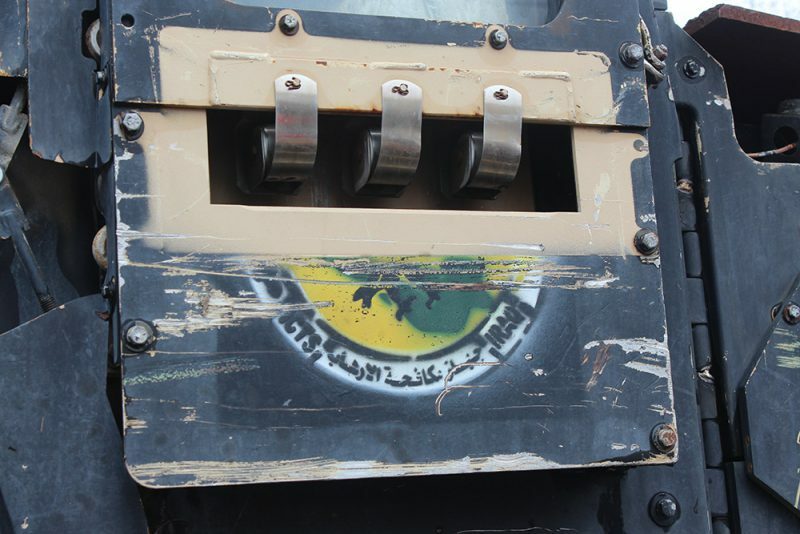 The door of the vehicle still bears an inscription “ICTS IRAQ” — this is an elite Iraqi Counter-Terrorism Service, a special forces service trained and equipped by the USA. 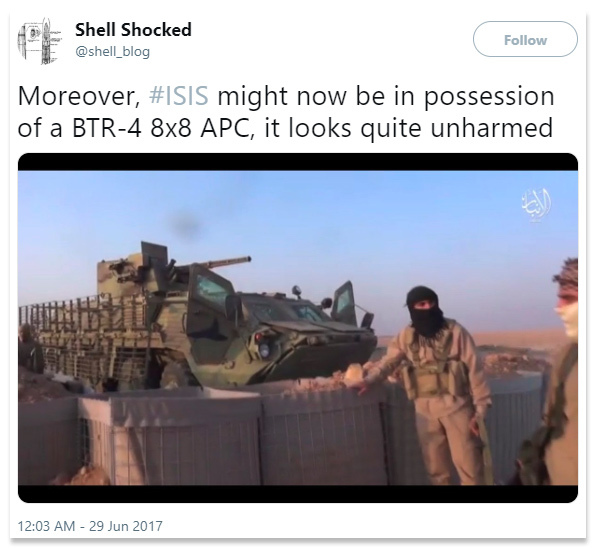 The photo below shows a similar ICTS Humvee in Mosul, which in 2017 was the site of heavy fighting between “Islamic State” and Iraqi forces supported by the US-led international coalition. 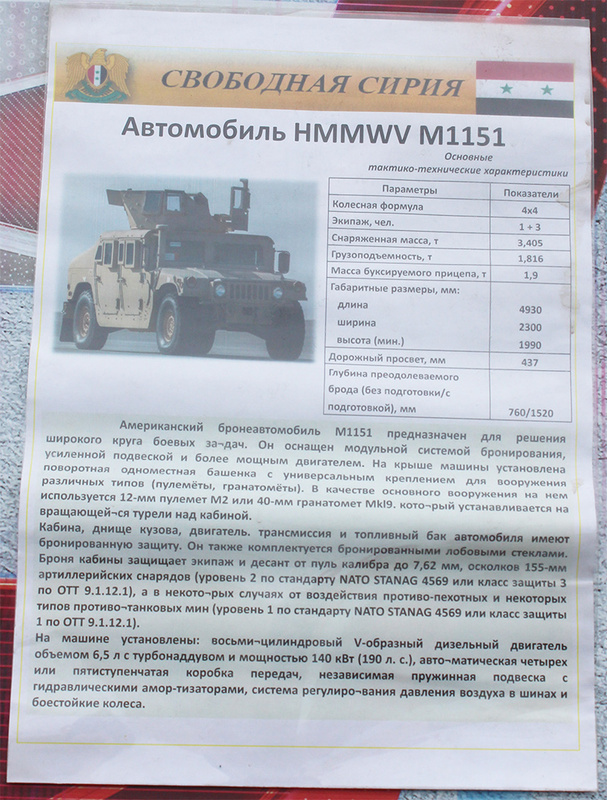 This information is absent from the information stand next to this HMMWV: it only features a general description of the American armored car. With few exceptions, that also concerns almost all information stands presented at the exhibition. 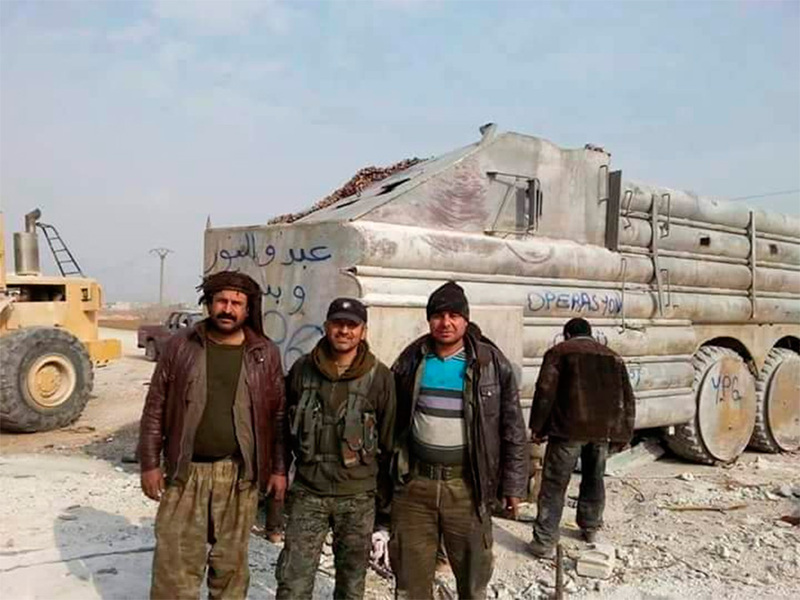 Another example of a vehicle that was first captured by IS militants and then captured from them by Assad’s forces is the “YPG Eagle Head” improvised armored personnel carrier of the Kurdish “People’s protection units” (YPG). 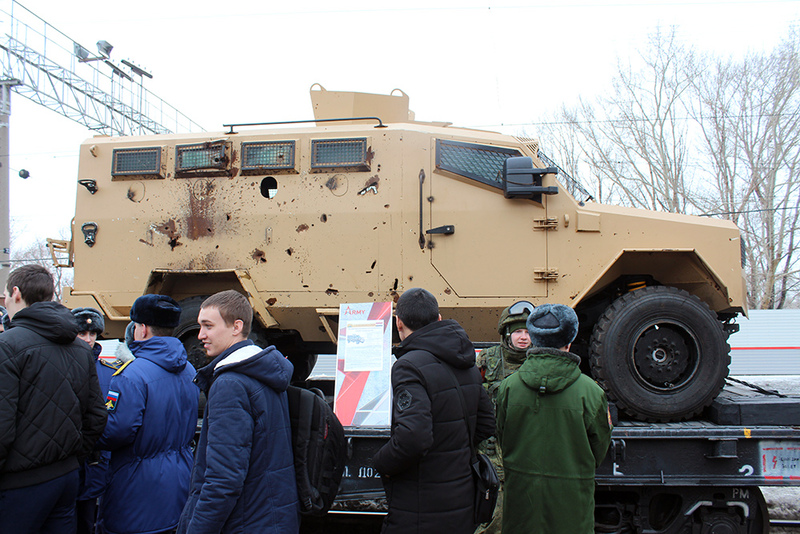 The text at the information stand states that the armored vehicle was assembled in Turkey. 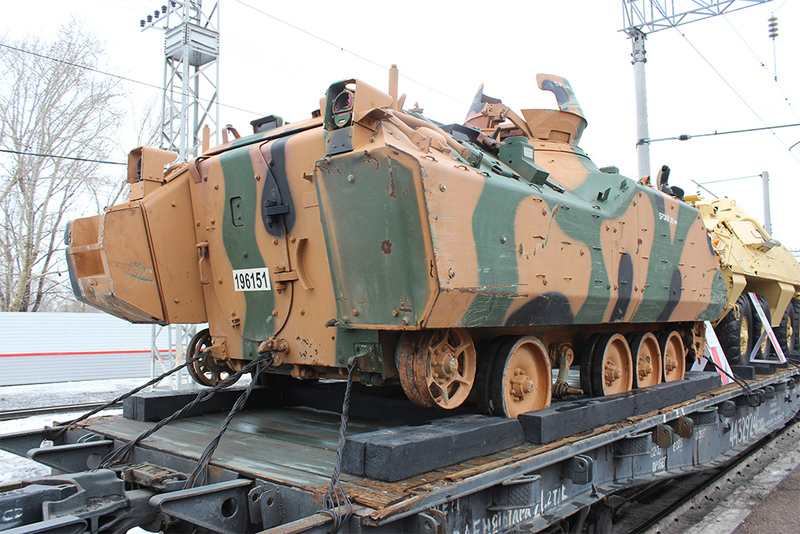 This, to put it mildly, is hard to believe: Turkey deems the YPG a terrorist organization and probably wouldn’t allow assembling and shipping vehicles for them from its territory. 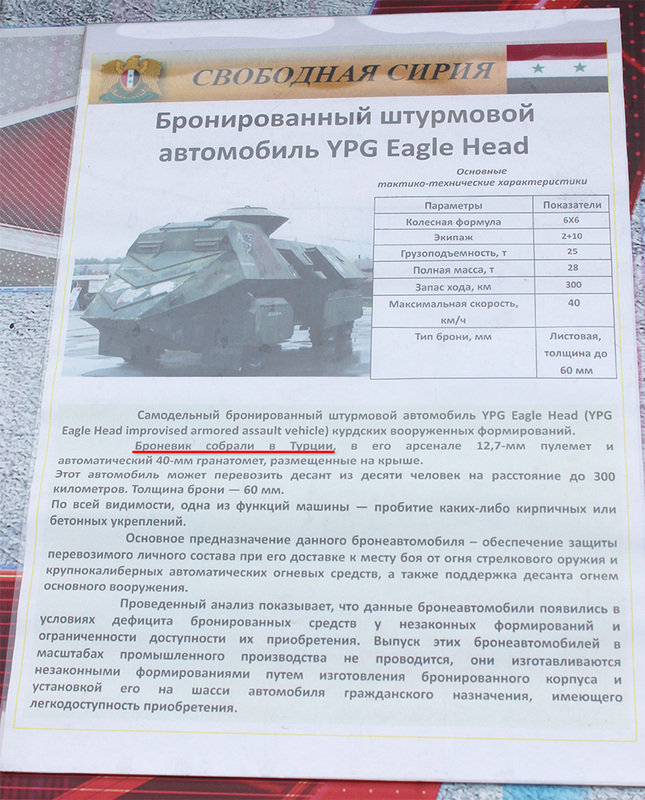 The “Eagle Head” is just one example of an impressive improvised combat vehicle fleet of the YPG: Before 2014, the Kurdish militias had no access to foreign shipments or any large military vehicle depots of the Syrian army, so they had to improvise. 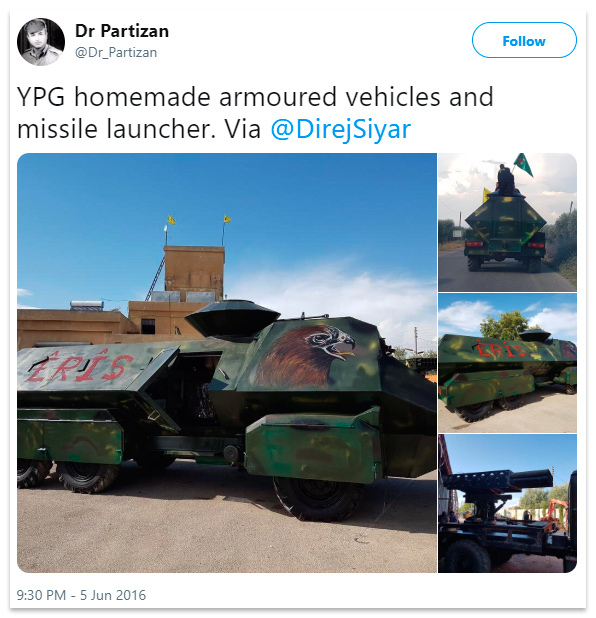 As for the “Eagle Head” itself, the last known photos of the vehicle in Syria are from 2016, when the APC was still in the hands of the Kurds. Apparently it was later lost in the fighting with ISIS and later was captured by Assad forces during successful offensives against the “caliphate”. 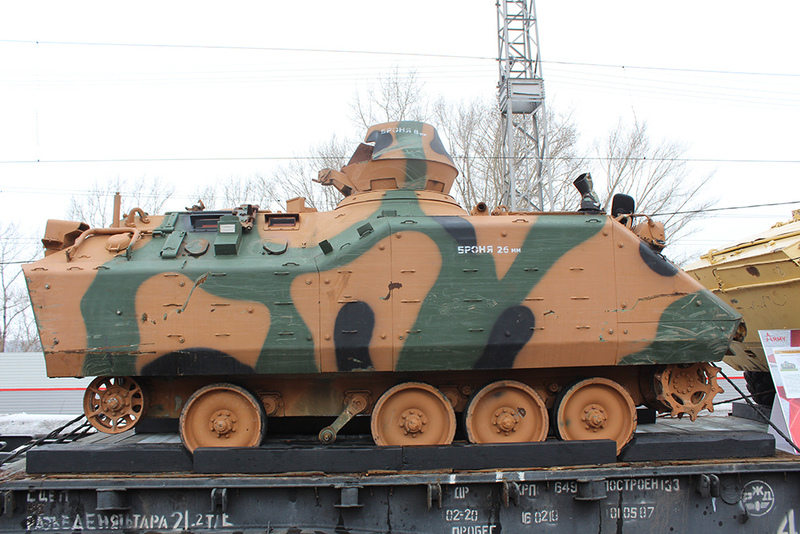 A Turkish ACV-15 armored combat vehicle, another piece of NATO equipment at the exhibition, tells a story similar to that of the HMMWVs. Researcher Hugo Kaaman found out that the vehicle was captured from ISIS by Assad forces near Maskanah in eastern Aleppo governorate. 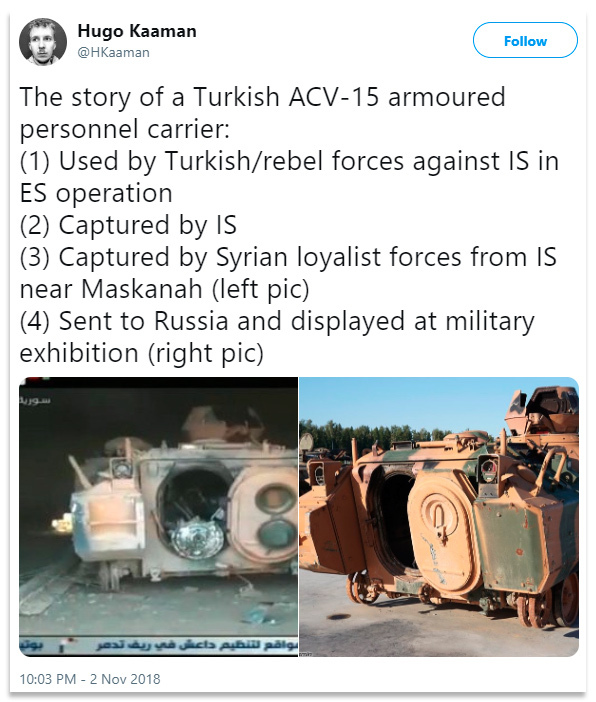 He suggested that the ACV-15 was part of the “Euphrates Shield” operation by the Turkish army and Turkey-backed Syrian opposition groups against IS militants and Kurdish militias in north Aleppo, where the vehicle was captured by “Islamic State”. 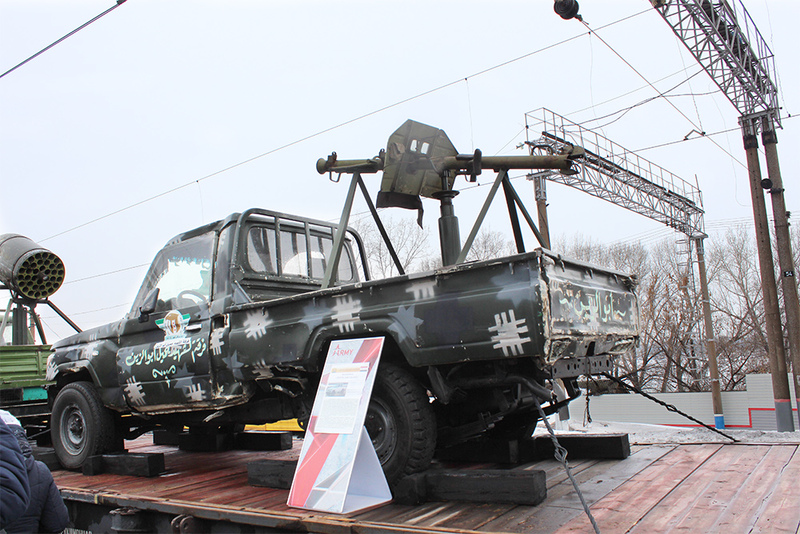 Many vehicles on the exhibition never belonged to ISIS. 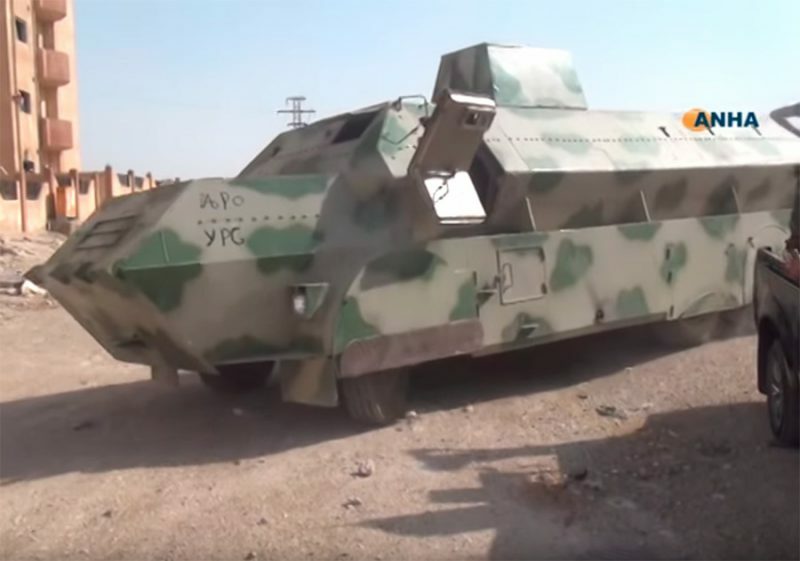 Some improvised and mass produced vehicles were captured from different Syrian opposition groups in north and south Syria. Among the trophies, there are two so-called “technicals” — pickup trucks with weapons mounted in the cargo bed. 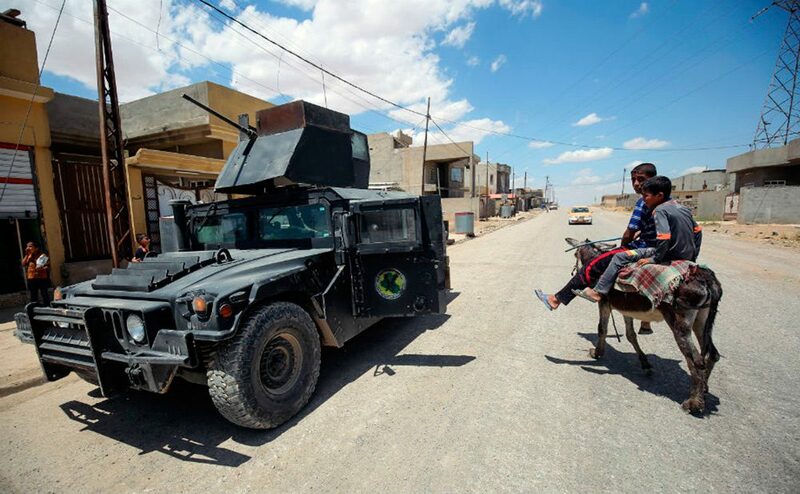 Vehicles like these came to symbolize Middle Eastern local conflicts. 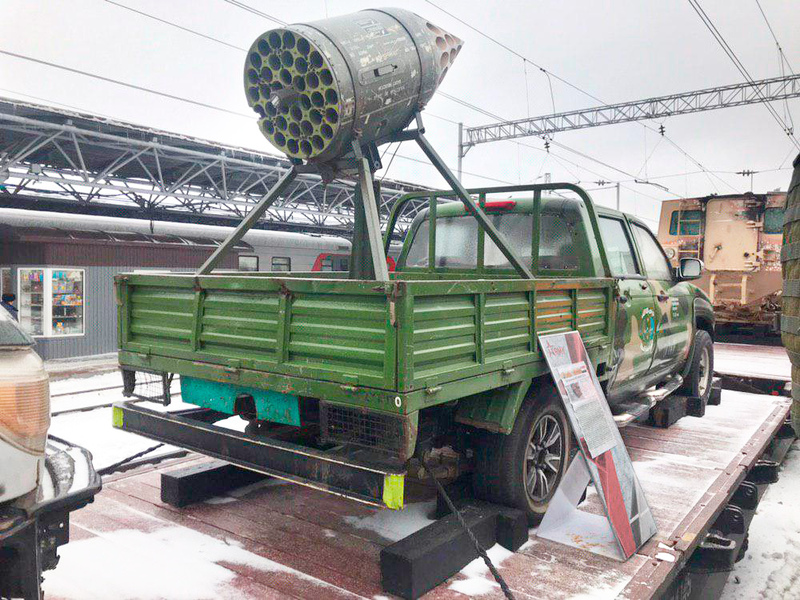 One of them is a Toyota Land Cruiser with a SG-82 rocket launcher, a later modification of the SPG-82 anti-tank rocket launcher (a HE rocket-propelled grenade was added, so the word protivotankovy ‘anti-tank’ was dropped from the designation). 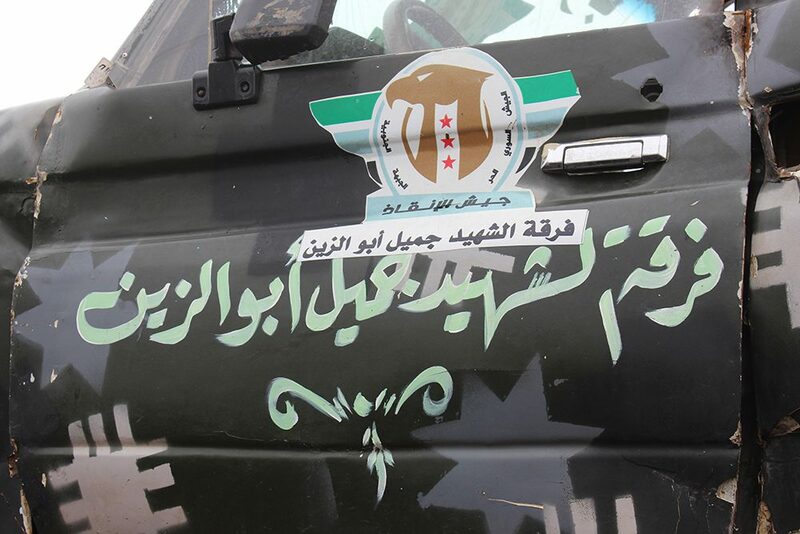 The logo on the car’s door is based on the green, white and black flag which was used as Syria’s national flag before the Baath party and the Assad family came to power. After the Syrian Revolution’s outbreak, it became the symbol of protesters and later of the “Free Syrian Army” (FSA) rebels. The logo says “Furqat al-Shaheed Jamil Abu Zayn” — “Jamil Abu Zayn Martyr Brigade”. This unit operated in the Daraa governorate, often called the cradle of the Syrian Revolution. 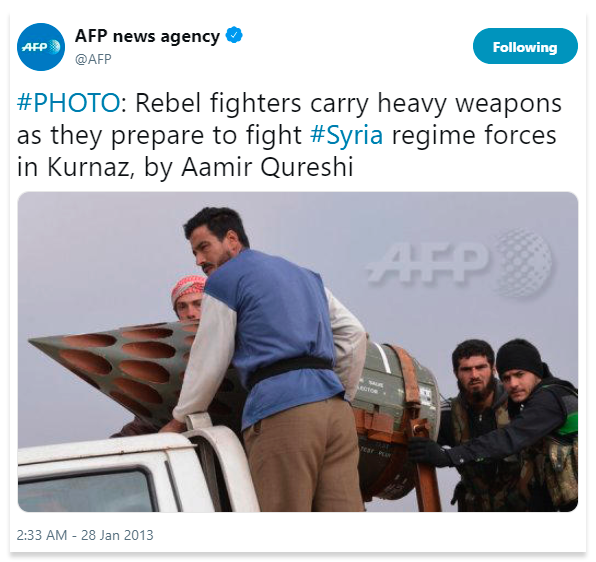 This and other groups of the Free Syrian Army “Southern Front”, which were mostly moderates, de facto capitulated in summer 2018. Toyota pickup trucks are very typical for Middle Eastern “technicals”, but the Japanese car manufacturer does not hold a monopoly in this market. 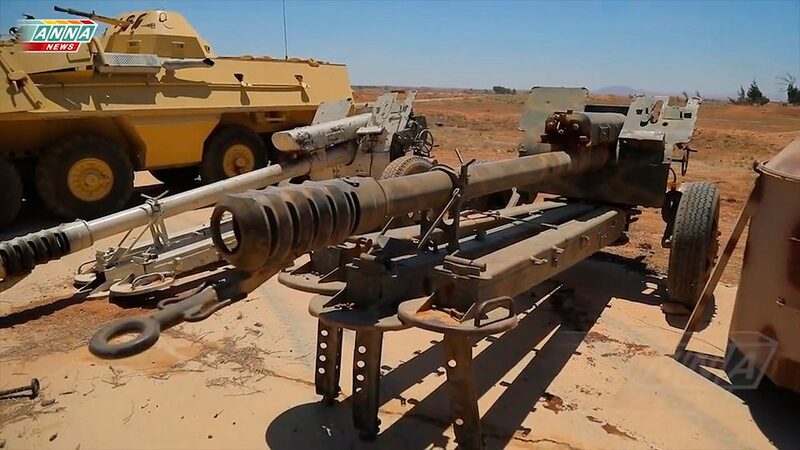 One example is a Chinese-made ZX Grand Tiger truck with armament which is pretty unusual to Syria: a French Matra F1 36-tube rocket pod from which 68-mm unguided SNEB rockets are launched. 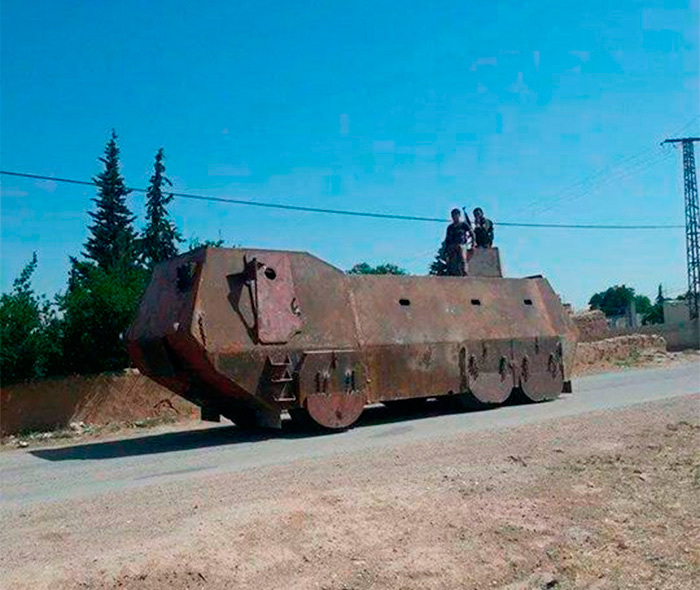 These pods, coming from Muammar Ghaddafi’s stocks, are occasionally seen in Syria. 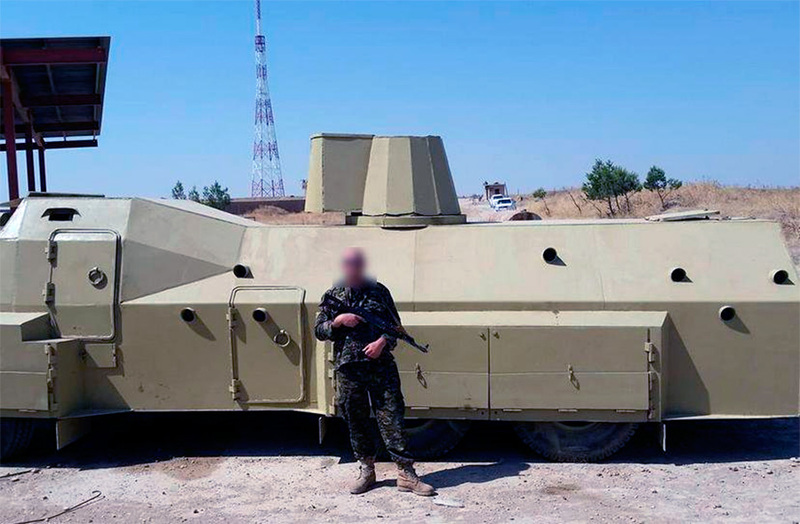 In 2012, one of them was spotted among smuggled Lybian weapons in Lebanon, and in 2013 at least three technicals armed with these pods were seen with rebels near Hama and Homs. 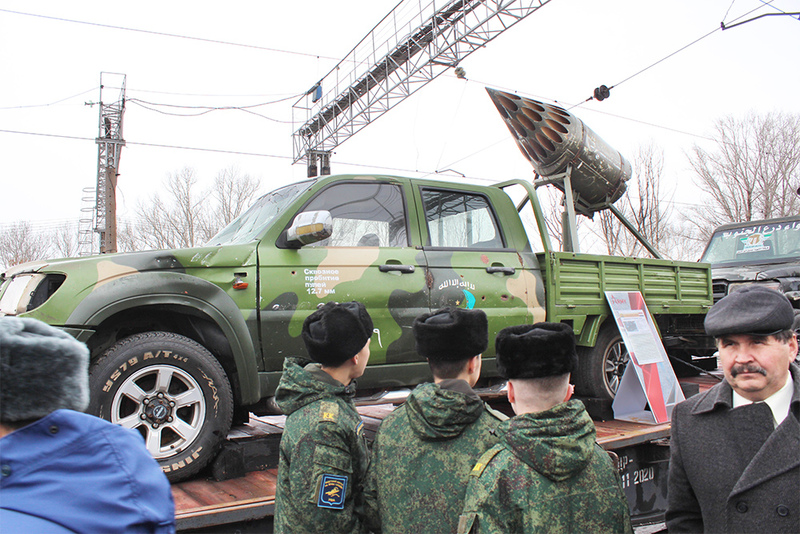 As we can see, the logo on this vehicle also alludes to the “revolutionary tricolor” flag. 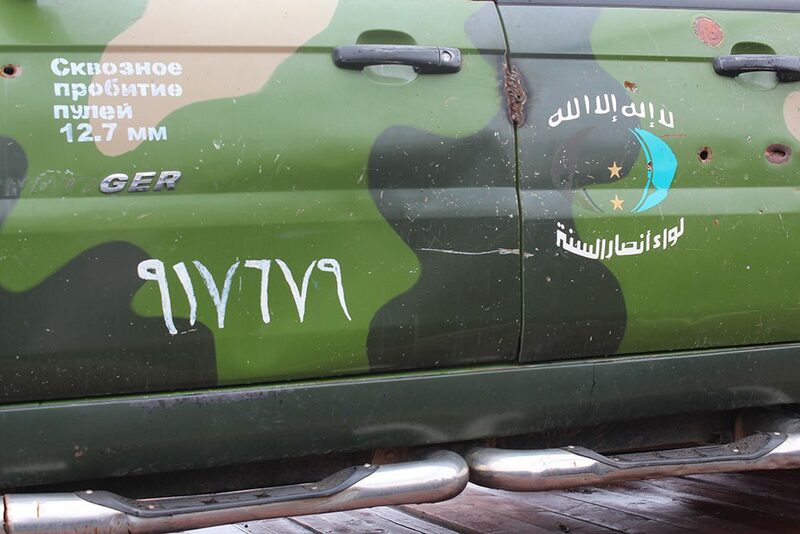 The writing says “Liwa Ansar al-Sunnah” (“Sunnah supporter brigade”) — another “South Front” group, which apparently surrendered roughly at the same time as Furqat al-Shaheed Jamil Abu Zayn. 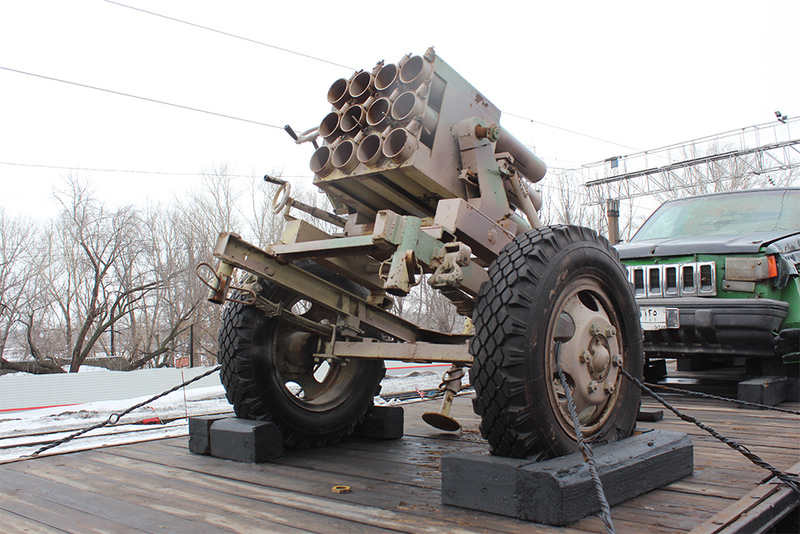 Another example of improvised weapons displayed is a so-called “Hell cannon”. 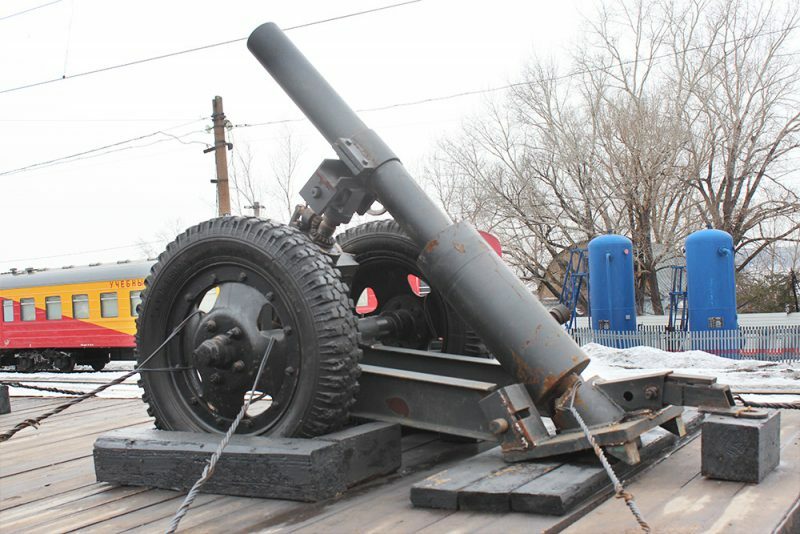 Improvised mortars like this one were made and used by rebels due to lack of artillery, with manuals on making them posted on YouTube. 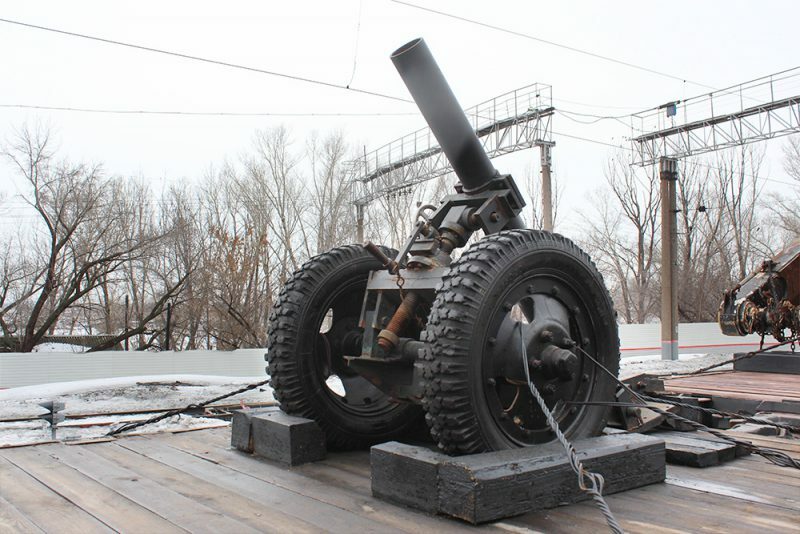 “Hell cannons” often used cooking gas cylinders stuffed with explosives as shells. 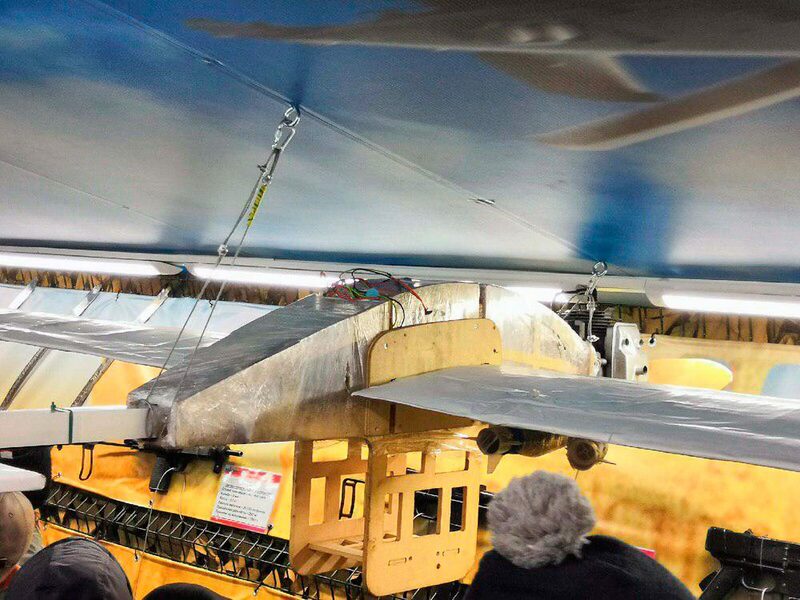 Yet another piece of the rebels’ improvised equipment is a fixed-wing drone, the likes of which repeatedly tried to hit Russia’s Khmeimim airbase. 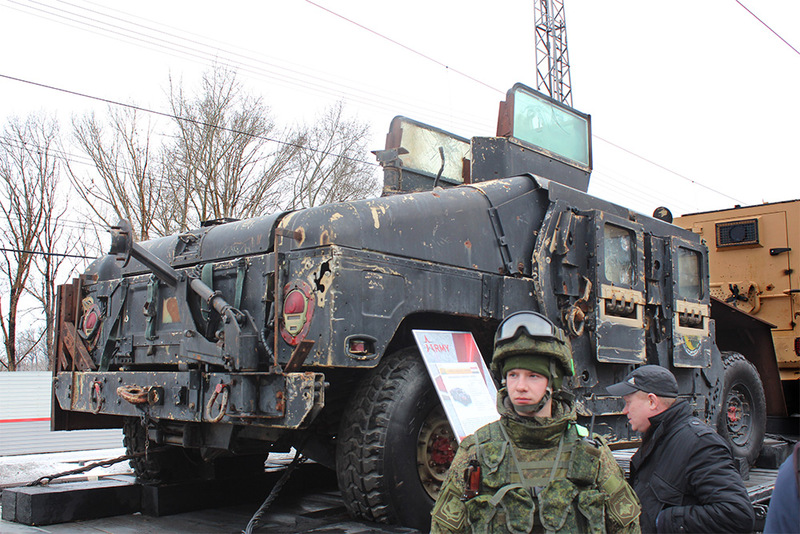 At least one attack damaged several planes and killed Russian soldiers. 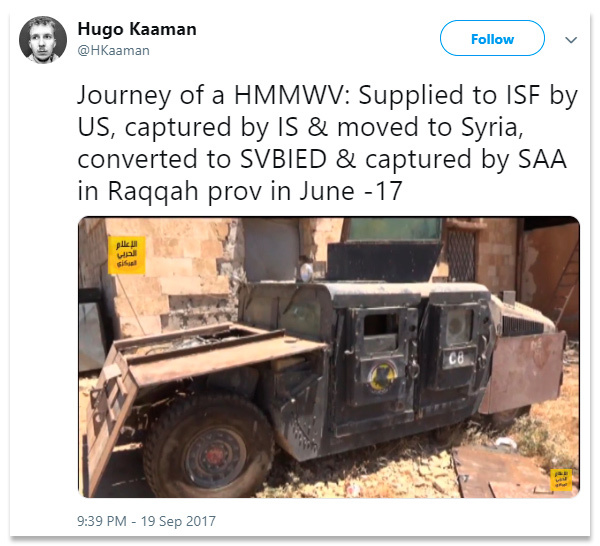 Not all Syrian rebel vehicles were improvised or captured from the regime: a lot of the vehicles were supplied by foreign partners, mostly Turkey and the Persian Gulf states. 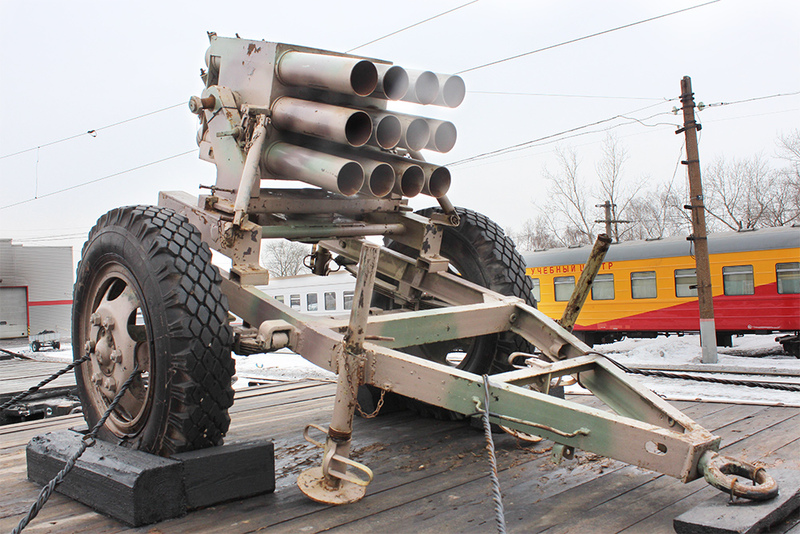 The equipment was often bought in Eastern and South-Eastern Europe (see this investigation by Balkan journalists for more details). 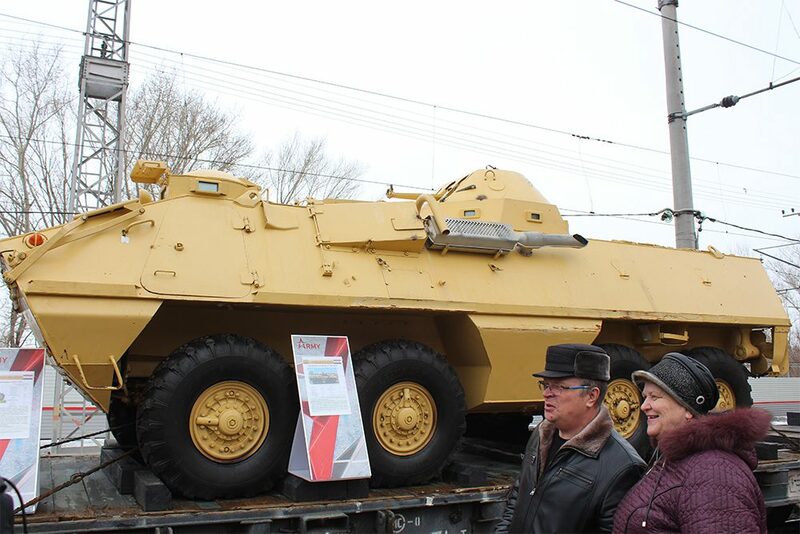 The exhibition shows two examples of such foreign-supplied equipment: a Croatian RAK-12 multiple rocket launcher and a Polish-Czechoslovak OT-64A armored personnel carrier. Even though in the 20th century the Syrian army did have OT-64 APCs in its inventory, these vehicles are quite a rare sight in the civil war, so this one was quite easy to trace. A video from a pro-Kremlin news outlet “ANNA NEWS” shows the APC among other trophies at Khalkhala airbase in south Syria in July 2018. Judging by the fresh paint job and the vehicle’s late arrival to the rebels, it was not captured in a Syrian army warehouse but shipped from Jordan. 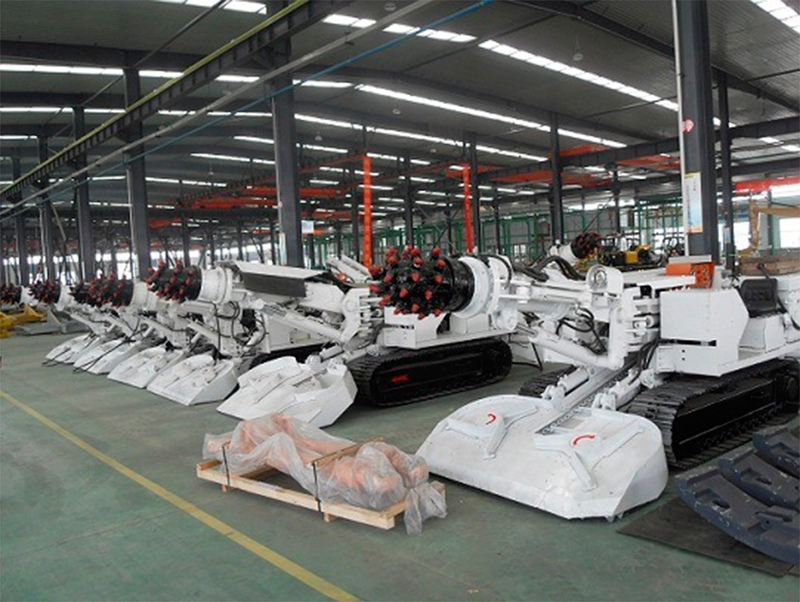 The shipments come not only from former Socialist countries. 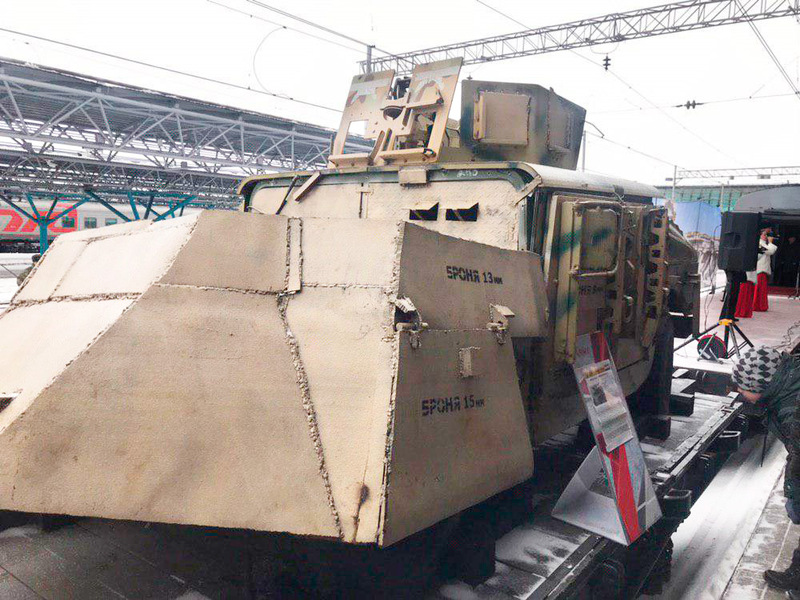 The exhibition also features an MSPV Panthera F9 armored car produced in the United Arab Emirates. The Panthera is one of the few exhibits, the information on which gives a certain idea on its origin. 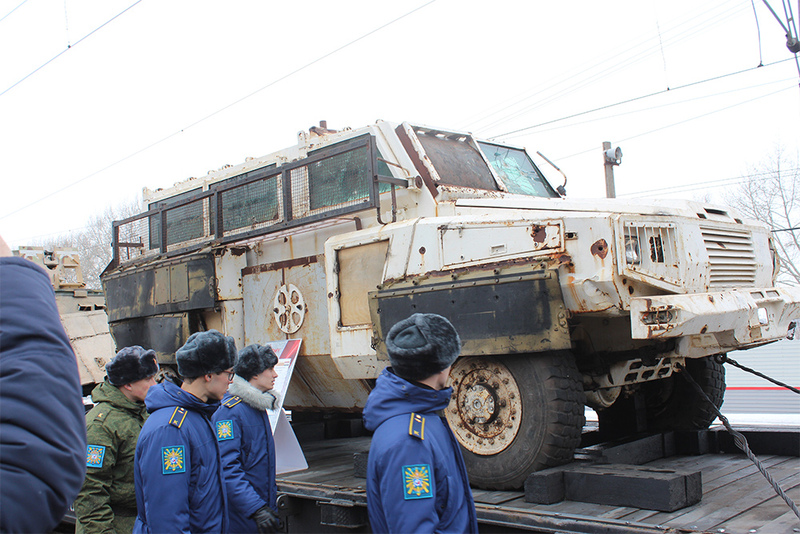 According to the information plaque, such vehicles were used by rebel groups during anti-government counter-offensives in early 2018, while later that year vehicles also got captured in the south. 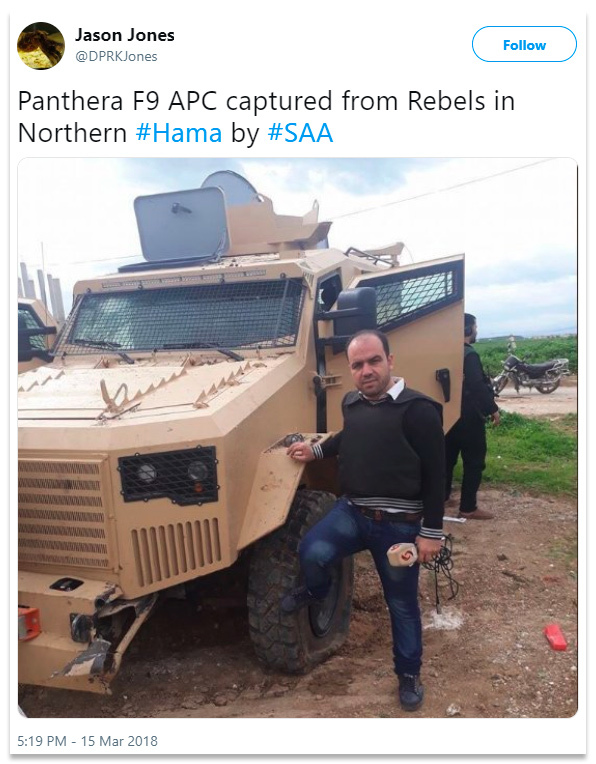 Indeed, the “Panthers” supplied from Turkey did take part in rebel operations in Hama in 2018. At least one of them was captured by pro-Assad forces. 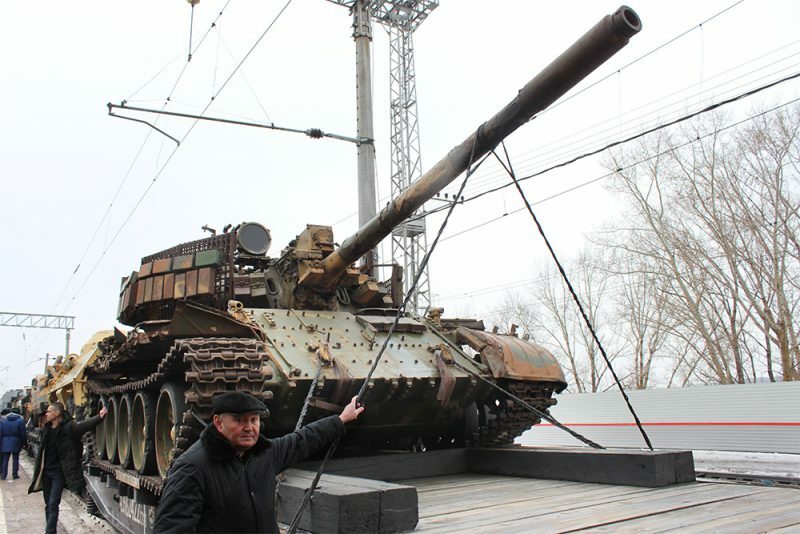 Interestingly, one of the photos linked above shows a T-62M tank supplied from Russia: most likely one of those captured by the rebels the previous year. Probably the most “exotic” trophy taken by Assad forces from the rebels is an RG-31 Nyala APC which used to belong to UN peacekeepers. 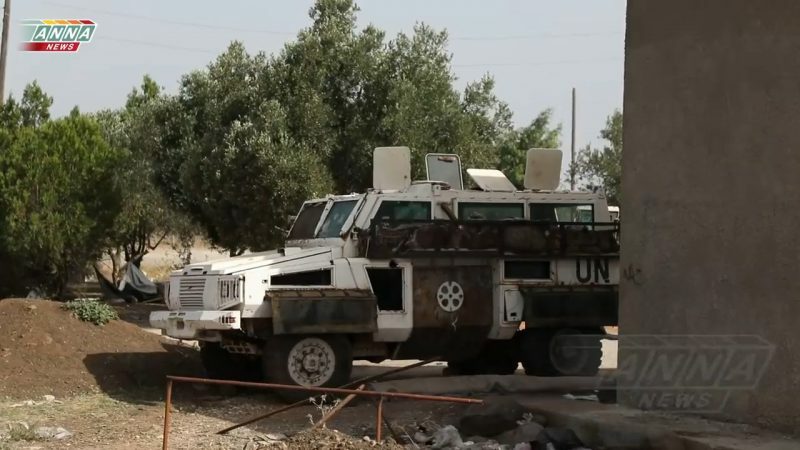 This vehicle is seen in another ANNA NEWS video that was filmed in July 2018 in Sayda, Quneitra governorate, after a successful pro-Assad offensive against the rebels in the area. 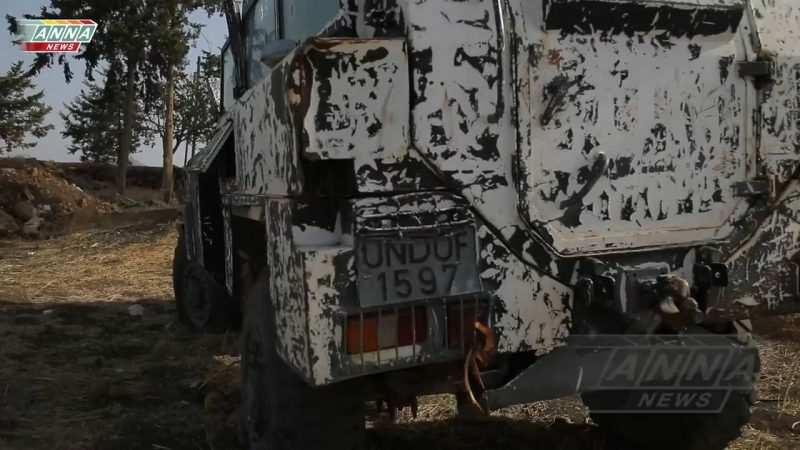 The video also shows the vehicle’s number plate with an acronym UNDOF — United Nations Disengagement Observer Force. The UNDOF was established in the Golan heights between the Israeli and Syrian troops in 1974, after the Yom Kipur War. 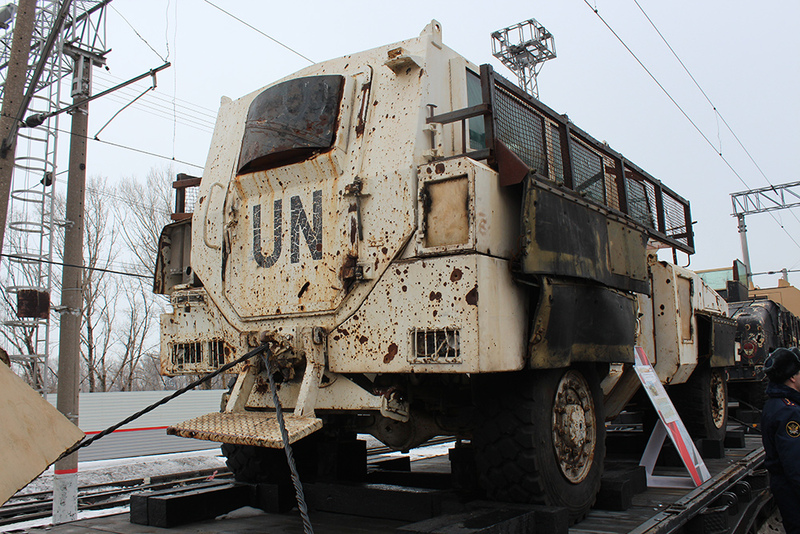 In 2014, as the conflict in Syria deepened, the UN forces retreated from Syria to Israel. However, apparently some of the vehicles couldn’t be evacuated. The exhibition also features non-combat equipment captured from the rebels. 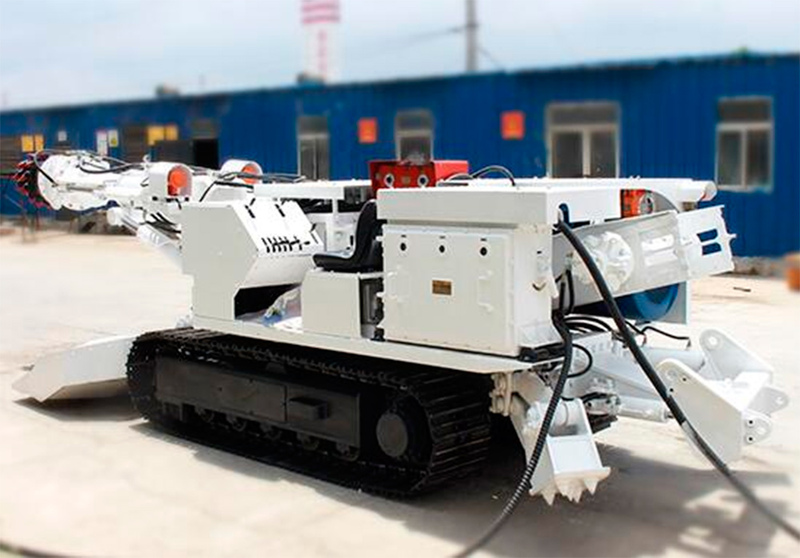 For example, a Carter EBZ-35 roadheader, produced by Chinese “Shandong Huasheng Zhongtian Machinery Group” (erroneously labeled at the exhibition as “XCMG tunnelling machine”). 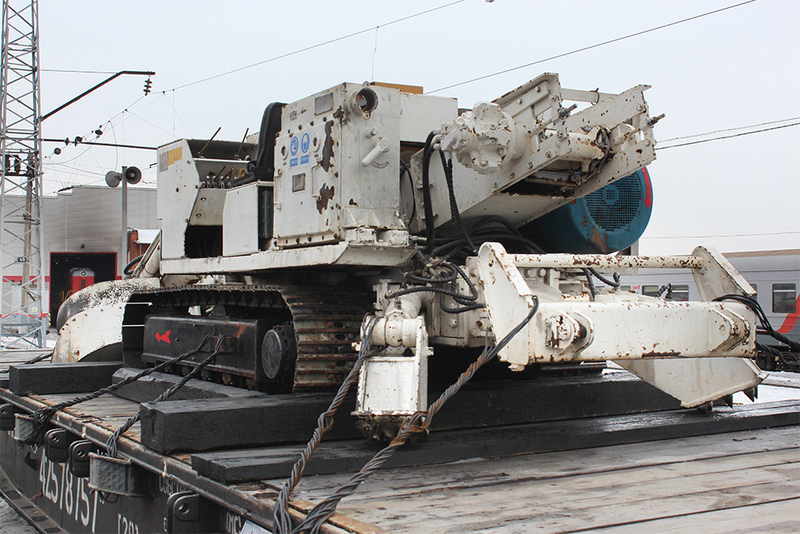 Earthworks equipment is heavily used by different sides of the Syrian conflict (the Kurds, rebels, terrorists, and others) to build static defenses or tunnels, the latter being essential for smuggling into besieged areas, as well as for operating military and civilian infrastructure (such as hospitals) under constant bombing. Sadly, the warring parties rarely cover the capture of such vehicles, so we were unable to find out the time and place where it was captured or the party it was captured from. However, according to the manufacturing date on the plaque (October 2012), it couldn’t have been shipped to Syria before the war and was likely brought into the country for military (or military-related) purposes. Some items displayed at the exhibition are examples of disinformation and propaganda. 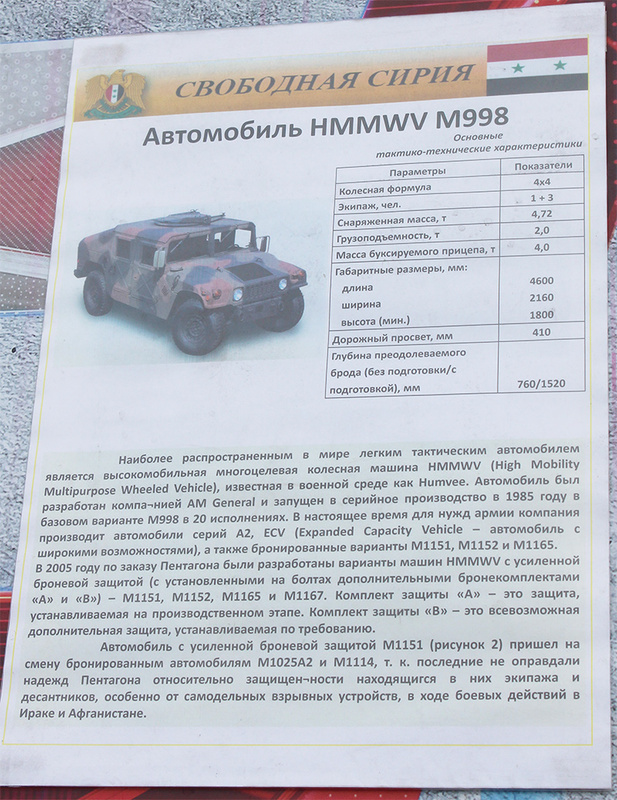 For example, various media cited the exhibition guides claiming that a T-55 tank presented there was allegedly shipped to Syria from Georgia. However, in fact Georgia employed T-55M tanks (since 1992) and T-55AM2 tanks (since 1998), while this tank is a T-55AMV with explosive reactive armor. 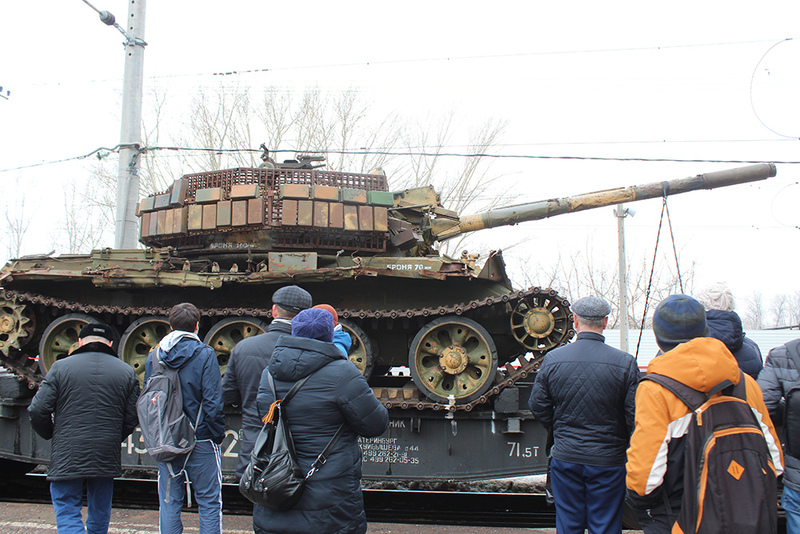 This tank was definitely captured from the Syrian army, which got 200 tanks of this modification in Ukraine in late 90s after they were modernized there. 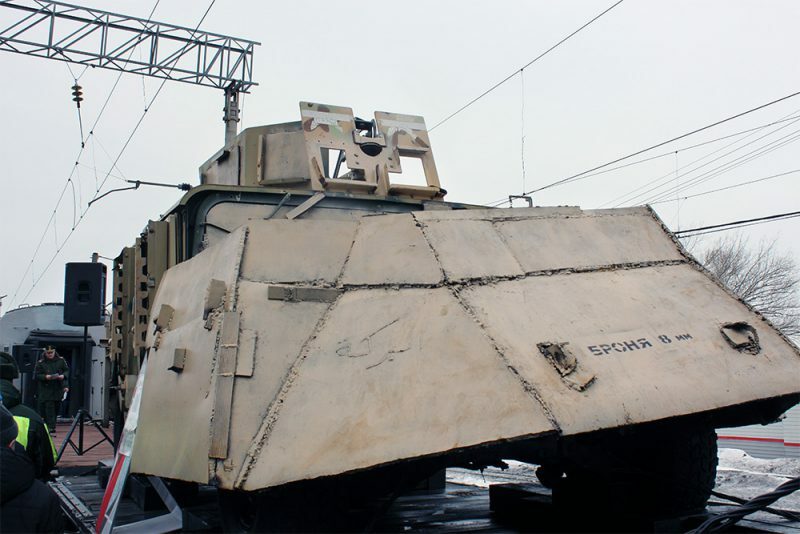 Interestingly, part of the reactive armor blocks were dismantled from the tank hull’s front armor and installed on improvised anti-HEAT screens on the sides and behind the turret. 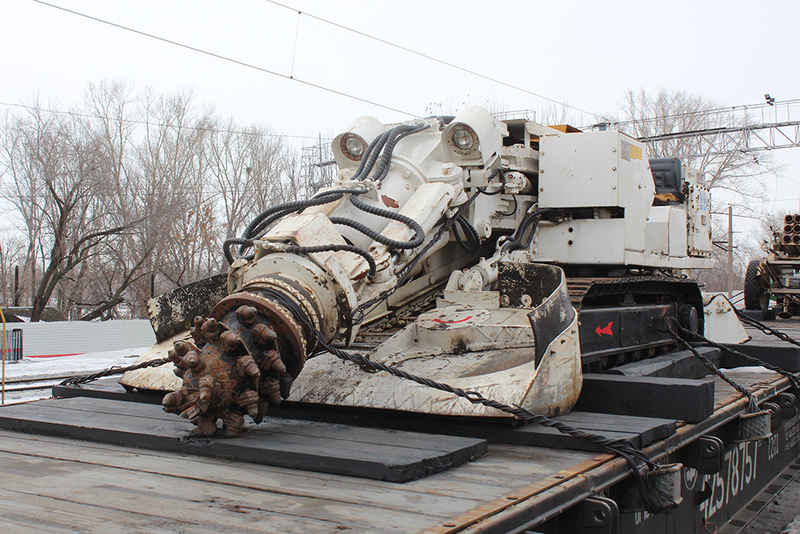 It’s unlikely that such a contraption would survive the activation of one of the reactive armor blocks. The South Front rebels (mentioned above) had many (possibly dozens) T-55AMV tanks (those modernized tanks most likely ended up in the south due to proximity to Israel). Photos and videos of trophies captured by pro-Assad forces show improvised anti-HEAT screens on the turrets of some tanks. However, we were unable to find this particular tank — most likely because too many vehicles were captured to film every tank, while the rebels did not publish many photos or videos of the vehicles in combat before they were captured (for whatever reason). 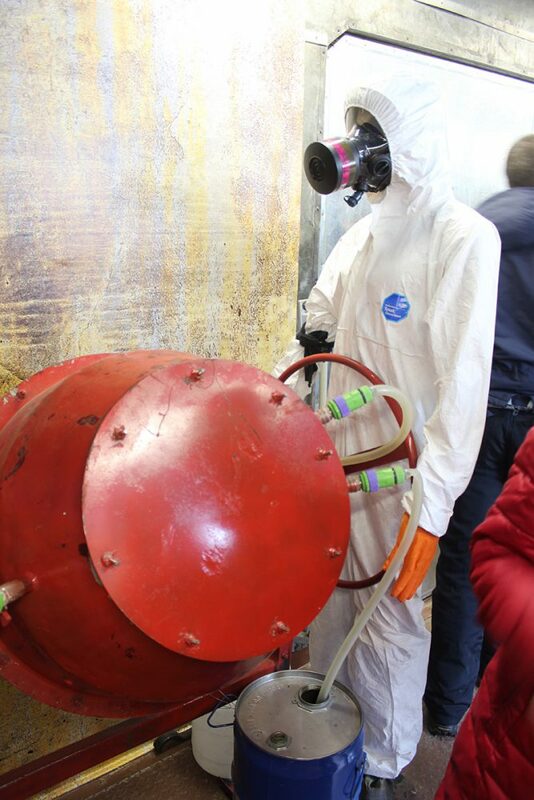 The most blatant example of deliberate disinformation at the exhibition is the so-called “militant chemical lab”. The alleged chemical laboratories found in Damascus suburbs captured by Assad forces were mentioned by pro-Kremlin media citing the Russian military in March and April 2018. Experts who talked to Bellingcat denied the possibility that the devices seen in Russian media footage could be used to make chemical weapons. 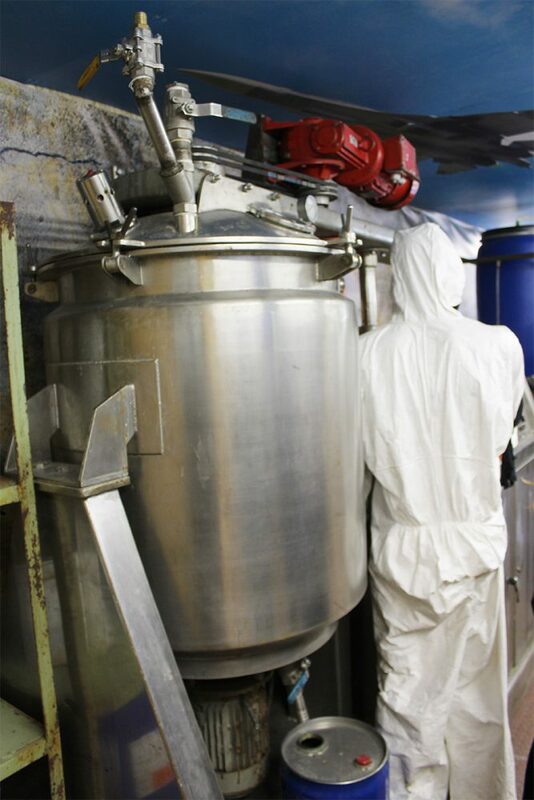 They believe the workshops were in fact used to manufacture improvised explosives. The same conclusion was reached by the Organization for Prohibition of Chemical Weapons in a recent report on the chemical attack in Douma city. One should recall that Russia’s official stance is that no chemical attack took place in Douma. In 2018 the Russian military regularly reported on chemical attacks being prepared by the rebels. 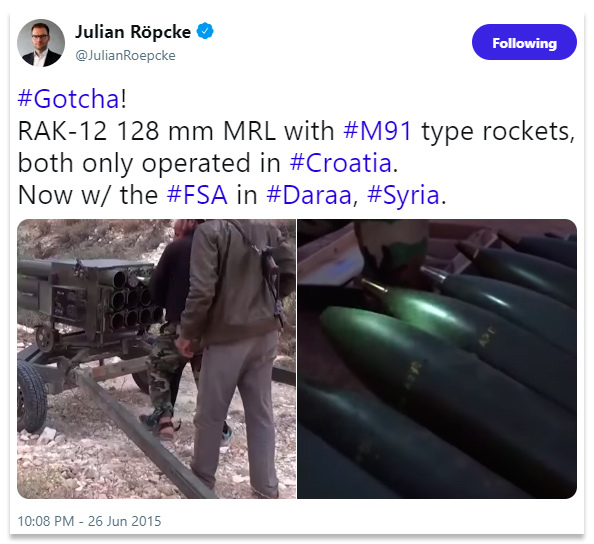 However, the last chemical attack in Syria that the Russian authorities did not claim as faked (even though they blamed the Syrian opposition) was a sarin attack in Ghouta in 2013. Despite the exhibition’s undeniable historical value, it is in fact an example of attempts to rewrite the history of the Syrian war. The exhibits are collectively called “terrorist equipment”, even though only part of the trophies were captured from ISIS, designated as a terrorist organization in Russia. There is also an obvious attempt to clear the Assad regime of chemical weapons use accusations. The exhibition also does not paint the full picture of the Syria war since there is no evidence presented of the pro-Assad forces’ war crimes, such as airstrikes and shelling of residential areas controlled by anti-Assad forces.